Using harmonica tabs to learn new songs is a fairly standard approach. However a beginner can be a bit confused by the different systems. In this article I will go through the systems of tabs I have come across to give my view on them. They are fairly straight forward and once you have wrapped your mind around them they all make sense. You will however probably prefer one or two above the others. I have divided the different flavors into a few classes depending on how they convey information. This division is based on how rhythm is notated (if at all) and how the pitches (or rather the hole of the harmonica) are notated. There is no real science behind this classification, it is a just a way to think about the different systems. Common for all systems is that the key you play in doesn’t matter. The same harmonica tabs can be used in any key. What matters however is what position the notation is in. This matters as the riffs you learn can become a part of your own riff bank for that position. This type is very common for teaching and is used by David Barrett who runs BluesHarmonica.com. The importance of David´s work with harmonica tuition cannot be overstated in my opinion. I would consider this type of harmonica tabs to be the standard and the most common. The style consits of standard musical notation with the holes of the harmonica noted below the notes. Air flow is noted with a +-sign for blow notes and draw notes have no sign. This feels very natural to my as second position is very draw note centric. 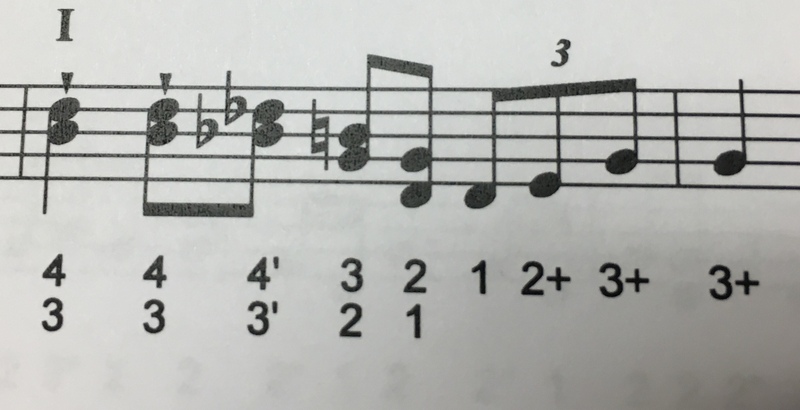 This type naturally notates the rhythm in the standard music notation. Even if you don’t like reading the notes you get a sense of the speed of the notes by distance between the numbers. 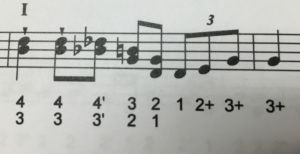 Notation of techniques are done both above the notes and after the hole notation. This may seem a little bit confusing at first but you normally get used to it quickly. Bends are notated with one or more ´-signs after the hole number. Slaps are notated by small rings above the notes and dips in the pitch are notated by small a downward facing arrow above the note or notes. Bascally any technique can be notated in this system making it a very rich and poweful tabulature system. The complete listing of notation symbols are found in David’s books or as part of his transcriptions. A side benefit of using this types of tabs is that you may learn the full standard music notation without extra effort. At least it will make any further studies in music notation easier. The style of tabs used by Joe Filisko is quite different from the previous style. Rather than notating rhythm in standard music notation this type has its own system. Every beat of a bar is divied into sub-divisions of the beat depending on the groove of the song. If the song is in a straight-eigth feel the quarter notes are notated by a horizontal line with two short vertical lines. One for each eigth note. If the song is in a shuffle feel each quarter note is notated by a horizontal line with three short vertical lines. Basically the quarter note is divided into triplets. The air direction is notated by arrows, upward arrows for exhale and inhale arrows for draw. Note bending is notated by horizontal lines on the arrows and the harmonica hole(s) played by numbers next to the arrows. These tabs also notate the techniques used such as throat tremolo or vamping. You find a complete listing of the notation symbols here. Tabs used by Joe Filisko. I have used this style of harmonica tabs quite a bit now so I really like it. I think it visually works very well for me. The rhythm of the riffs can be worked out quite easily. If you want to send harmonica tabs you a friend and use one of the two systems above you will most likely have to send a JPEG-image. To avoid this you can opt for a more e-mail friendly system. Some tabs-oriented sites use this type of system as well. These systems do not notate the rhythm at all but only notate the holes played on the harmonica. The sign used to notate the air direction can vary and so can the placement of it, before or after the number. The examples below show the same riff notated with different systems. To be honest, I am not a big fan of using ´-´ or b/d-notation but I guess it is a matter of what I am used to. You will sometimes come across a combination of the standard music notation tabs and the simple e-mail friendly tabs. That is when the simple tabs are complemented with music notation that is not notating the pitch. See the picture for an example of the rhythm notation. This type of notation is not very common from what I have seen. Sometimes you come across tabs that use arrows for airflow direction but with no exact notation for rhythm. For these systems the length of the arrows normally gives an indication of the length of the notes in relation to each other. Bent arrows notate nemt notes. Notation with arrows and numbers. I find these systems to inexact to be really useful. They do give support when you also have a recording of the song or riff. This style of tabs is used in “A Sourcebook of Sonny Terry Licks for Blues Harmonica” by Tom Ball which also includes recording of the licks. I have found a variation of the arrow based system in a few books. This variation looks a lot like the system used by David Barrett but uses arrows for air flow direction and bends. It also seems to have fewer notations of techniques making it less powerful in my opinion. See the picture below for an example. This method is used in “Blues Harmonica Collection” by David McKelvy. Combination of standard music notation and arrow tabs. Some tabs you come across combine harmonica tabs with song lyrics and when you do that you will get a sense of the rhythm without notating it. This is not a good option for instrumental songs for obvious reasons. There is an example here. As you can see there are a number of ways of notating harmonica tabs and with a little bit of thinking you can navigate most of them now. For my part I really think that the systems used by Bavid Barrett and Joe Filisko are the most versatile, exact and useful. I hope you find this articel useful, let me know if you have any questions. Don’t forget to share this and to sign up to my newsletter below.